A starry anniversary discussion of the film Wag the Dog turned testy on 4 December when moderator John Oliver confronted Dustin Hoffman about allegations of sexual harassment. Dustin Hoffman-John Oliver. Images from Twitter. Hoffman seemed blindsided and defensive by the line of questioning from the host of HBO’s Last Week Tonight. Hoffman explained the accusation was 40 years old. “I don’t love that response either,” Oliver said. Hoffman shot back: “What response do you want?” Hoffman maintained that he did nothing wrong. Actress Anna Graham Hunter has alleged that Hoffman groped her and made inappropriate comments when she was a 17-year-old intern on the set of the 1985 TV movie Death of a Salesman. Actor Terry Crews, who has been outspoken about his own experience as a victim of sexual harassment and filed a lawsuit against his alleged attacker on 5 December, tweeted his support to Oliver. Oliver has received immense support and praise from the Twitter community as they have applauded his actions of holding Hoffman accountable for his deeds. Tweets poured in from everywhere and people commended the British comedian for calling Hoffman out. We don’t need to hear about how you are the father of daughters. We don’t need to hear how much you care. 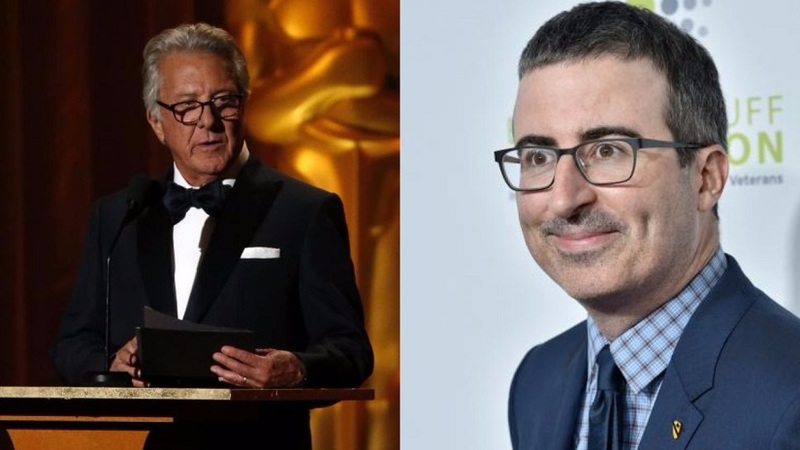 John Oliver rightly roasted Dustin Hoffman with a quickness because it’s 2017 not 1975. More guys need to grow a pair and call out men who continue to embarrass our gender because they are so utterly unappealing to other women and/or men.